"Can anyone see a way across to it? I didn't think so... There are a few other bridges that we cannot see the ends of, but they seem to be quite a hike from here to get to them..."
"We may have no choice... We need to gain access as quickly as possible so we can move on to the next structure. 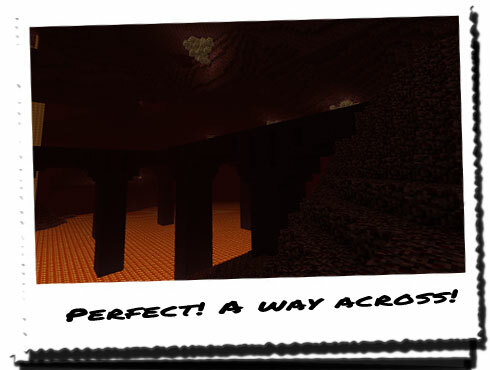 As well as that, we're coming to the end of another day; I don't know about you two but I'm beginning to flag slightly..."
"We should head over to the far Eastern side of the lava lake and then hope we find a way across to the main structure. 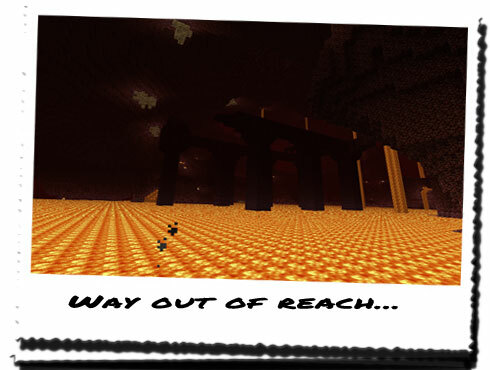 It would be too dangerous to camp out in the Nether, especially when we're that close to one of those structures." That was an incredibly close call! We managed to find a way across to the Eastern side of the lava lake and were surprised to find our path to the South completely clear of obstructions. Being safe however we stuck to the shadows and ensured that we didn't do anything that might draw attention to ourselves. As we continued to climb higher to be able to later reach the structure, we came across a small group of people who we initially couldn't determine the identity of. They had to be HoN Co. guards as no-one else was in the Nether, to our knowledge, and true enough as we crept closer we were able to see they were HoN Co. guards. There were four of them walking together as a group heading North, as though away from the structure we were slowly making our way to. At one point they stopped, and one of the guards pointed in our direction. We froze... The other guards looked in our direction too; one seemed to squint to get a better look, before waving a hand in our direction and saying something to the guard that had pointed at us. The other three guards continued to move on, but the first guard stood still for a while, continuing to stare up at our location. We couldn't tell if he knew we were there and he was waiting for us to make a mistake by moving, or if he genuinely had no idea at all. We remained motionless the entire time he stared at us, and we continued to do so until he was out of sight. We each let out a sigh of relief, and stood up properly, continuing to head South, this time at a faster pace. "It seems they're definitely searching far and wide for us... Luckily they seem to be searching in the completely wrong direction! Let's hope it stays that way..."
"How do we know they weren't a team sent in to recover one of the Eyes of Ender...?" "We don't... We just have to hope that's not the case." We carried on South for some time longer before the large wall to our right began to thin out and then disappear, exposing the lava lake we had once been on the edge of a few hours earlier. As we drew closer to the edge of the cliff with a plummeting drop to the lava below, we were able to make out the structure off in the distance, more towards the centre of the lava. Looking around, we tried to find a way across, when we turned around and did a double take. There was a bridge. A bridge connected to the edge of the cliff. An intact bridge connected to the cliff, leading all the way to the main bridge network. "Excellent! Let's get across and find a tower to settle in for the night. Perfect timing, if I do say so myself!" We managed to find a tower pretty close to the main structure; the presence of a small lava basin in the centre of the entranceway suggested the location of the main structure, and the tower was set off just off to the East a little. We had crossed the bridge system without any bother at all, and now we could settle down for the night. I wonder if I'll have that dream this time...?